BJD had condemned the statement made by a railway authority which had hurt the sentiments of Jharsuguda People. 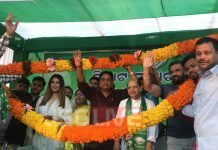 Later On which BJD had called in for a Press Meet on 6th May and decided that BJD will call in for a Pratibad Sabha which was organized today . This Sabha was started by holding a rally from the BJD Party Office to the Jharsuguda Railway Station. Shri Kishore Kumar Mohanty ,Ex- MP Rajya Sabha , Ex- Speaker ,OLA had told that statement made by G.M. was defamatory to the sentiments of Jharsuguda people and if the demands are not fulfilled than there will be big agitations. He also demanded that Jharsuguda should be included in East Coast Division. A memorandum of the demands had been addressed to the Railway Minister Shri Mukul Roy which was given through Jharsuguda Collector. This Meeting had seen almost all BJD top leaders marking their presence i.e. Rabi Singh , Vice President , BJD , Jay Kumari Patel , President , BJD Mahila Morcha , Miss Sadhna Samata Ray , Gen. Secretary , BJD Mahila Morcha , Mitrabhanu Sahu , President , BJD Krusak Morcha , Prasanta Jena , President , BJD Chatra Janata , Rashmi Rekha Mishra , Chairperson Belpahar Municipality , Nand Kishore Agarwal , Chairperson , Brajrajnagar , Sandip Awasthy , Sr. BJD Leader , Jagabandhu Kishan , Vice – President , BJD , Satpal Singh , Secretary , Gurudwara Sri Guru Singh Sabha , Dr. Hamid Hussian , Member of State Council Odisha , Mukesh Tiwari , Chairman , BJD Legal Cell along with many supporters who had joined this Sabha.